For many overseas travellers, when they think of Australia they picture endless coastal sunshine and the scorching heat of the outback. However, in many regions across the country when autumn turns to winter it can bring with it many additional road hazards. If you are planning on renting a car in Australia at this time of year, there are some additional factors you should be aware of. Drivers need to take extra caution when driving on country roads in challenging conditions, particularly in alpine regions. VroomVroomVroom has put together a few tips to help you stay safe on the roads this winter. It is a good idea to drive slowly and carefully in general, but travelling at high speeds is even more dangerous during winter. Wet, icy roads can greatly impact your car's ability to slow down. Keep an appropriate following distance between yourself and the vehicle in front of you. Avoid hazards by braking gradually before you reach corners. Leave early and allow yourself extra time to reach your destination so you will not be inclined to rush. Remember that the unstable weather conditions can make for increased risk on the roads. In winter there is a danger of black ice on the road. This is a thin layer of ice on the road's surface that is difficult to detect. 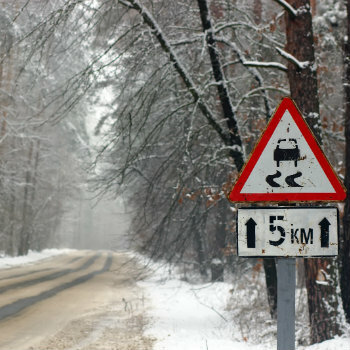 Avoid making any sharp turns or braking suddenly as this could cause your car to slide on the ice. If your car does go into a skid, ease pressure on the accelerator and avoid braking too heavily which will further lock up your tyres. If the back wheels of your car slide on the ice, avoid turning your wheel too sharply which can make the problem worse. Prevent sliding by braking gradually before you reach corners, and maintaining slower speeds. Before you begin your journey, it is a good idea to check your car and make sure everything is functioning. Check the tread in your tyres, and add extra pressure if required. The older the tyres the more likely they will be to struggle on icy roads. Ensure your car is fitted with a spare tyre, and thoroughly clear any snow and ice off your car before driving. Make sure you have plenty of fuel in case any hazards on the road cause delays. In alpine regions of Australia, drivers are required to have snow chains in their vehicle. These chains help your tyres' grip in challenging conditions. 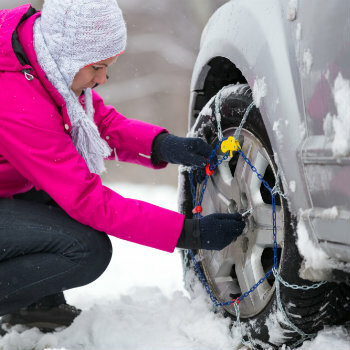 Be sure you are familiar with how to fit the snow chains before you leave, and if possible use fitting bays when installing them to your car. You only need to fit chains to the two driving wheels of the vehicle (unless driving a four-wheel drive). Do not drive faster than 40 kilometres per hour with snow chains. While driving in colder weather the car windscreen is more likely to fog over, creating poor visibility for the driver. To avoid this, turn on the air-conditioning to lower the temperature, which should quickly resolve the problem. Check all of your headlights and indicator lights are working before you set off. In areas of low visibility drive with your lights on low beam, and if you are forced to stop for any reason be sure to use your hazard lights. Only certain car rental companies will allow their vehicles to be taken into the snow, such as Hertz, Thrifty and Europcar. They all require customers to purchase additional Snow Cover if they are planning to drive their cars into this region.